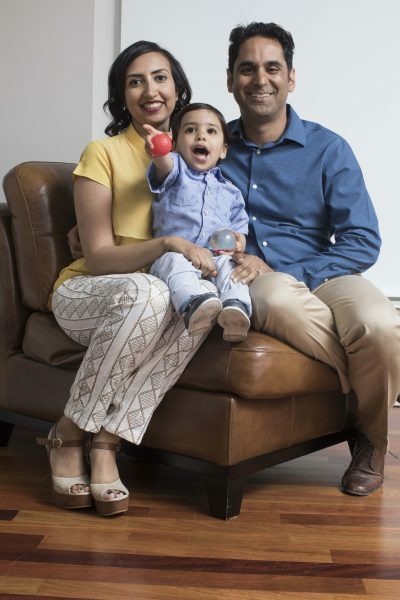 Pooja, Anish and their son Sushil in their home. Pooja, Anish and their son Sushil in their home.Pooja, Anish and their son Shushil in their home.Together, in late June 2009, Anish and Sheila established the Sheila Kirpalani Foundation. It would be one of the last things they did together – two weeks later, Sheila passed away. Grief-stricken, Anish persisted, finding comfort in carrying on his mother’s legacy through her fund. “It was very helpful in the healing process and getting over the loss of my mother,” Anish recalls. “It allowed him to redirect his energy and have something to look forward to when she wasn’t there anymore, and be able to share that with others,” says Pooja, Anish’s wife. From then on, Anish has kept his mother’s memory alive by nurturing her greatest passions in others. Since 2010, the fund has awarded the Sheila Kirpalani Biology Scholarship to a total of six graduating students at Central Toronto Academy, the school where Sheila once taught. Anish has also supported life-saving research and advocacy at Pancreatic Cancer Canada. But the most meaningful way Sheila’s legacy will persevere is through her grandson, Sushil, who is named after her. Anish and Pooja already see Sheila’s fearless spirit and musical talent in their son. Later this summer, the family will honour Sheila’s love of music at a classical North Indian concert sponsored by their fund, as part of Harbourfront Centre’s Summer Music in the Garden series.